You may update the firmware on your Room Alert Monitor or TemPageR using AVTECH’s Device Discovery utility or Device ManageR software. (1) Download the most recent version of your unit’s firmware from your account at RoomAlert.com. This FAQ shows you how: How to Download Firmware & Software from Your RoomAlert.com Account. 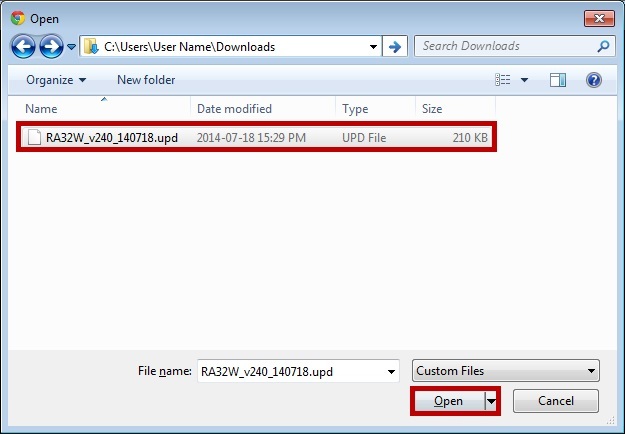 The firmware update file should download with a .upd extension. (2) Update to the latest version of the Device Discovery utility or the Device ManageR software. They are available through your account at RoomAlert.com as well. (3) Room Alert 3 Wi-Fi only: set the unit’s password back to the default, “PASSWORD.” You may change the password back after the firmware update completes. (4) Perform the update from a computer on the same local subnet as the Room Alert Monitor. Firmware updates use the TFTP protocol. 1. Open the Device Discovery utility. You may find it in your Windows system typically through the default path: C:\Program Files\AVTECH Device Discovery Utility. 2. Select Search. After a moment, your devices will populate the screen. 3. Select the unit you wish to update. 4. Select Update at the top right corner of the screen. 5. 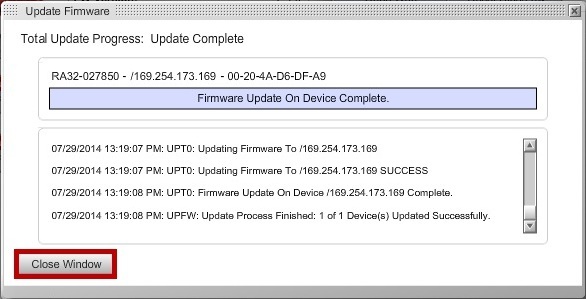 When the Update Firmware alert appears, select OK.
– Select the file, and then select Upload. 7. You’ll see a Progress box appear, which gives you the option to cancel the update if you wish. 8. Once the firmware file has been uploaded, the Please Review Update.log File dialog box appears. – You may select Yes if you’d like to view details about the update; otherwise, select No to close the box. 9. Your unit will reboot with its firmware updated. 1. Open Device ManageR in your web browser. You may open it by entering ‘localhost:8080’ or ‘<IP of host system>:8080’ in your browser’s address bar. 2. Your devices will immediately populate the Discovered Devices list to the left. 4. Select Update Firmware, which you can find as a link below the unit name in the device list or as a button in the main viewing pane to the right. 5. When the Update Firmware dialog box appears, select Browse. – Select the file, and then select Open. 7. The Update Firmware dialog box will now display the name of the update file. Select Update. 8. You’ll see a progress bar and information about the status of the update. Once it is complete, you may select Close Window to close the dialog box. 9. Your unit will automatically reboot with its firmware updated.